The Office of Fair Trading's arguments on bank charges have "several flaws", the High Court has been told. Mr Geoffrey Vos QC was defending Nationwide, one of eight lenders who have been accused of levying unfair overdraft charges. The OFT wants the court to rule it can decide the banks' charges are unfair under consumer contract regulations. Mr Vos said the building society supported the banks' belief that the rules did not cover their contracts. Nationwide and the seven banks agreed to the test case to clarify their legal position after a mass of litigation, which has seen hundreds of thousands of consumers claim refunds totalling hundreds of millions of pounds. Mr Vos was addressing the court on the sixth day of the hearing. 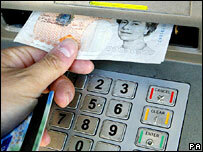 The barrister told the judge, Mr Justice Andrew Smith, that overdrafts were a fundamental feature of current accounts. Mr Vos said bank customers across the country drew on their unauthorised overdrafts to the tune of £600m a day, and this was part of the standard service used by millions of people every year. He said the fact that a huge number of customers went into the red meant that charges for overdrafts were not an aberration, or for an ancillary service as the OFT had claimed. The arguments put forward by the OFT, he argued, had "several flaws". He went on to set out the specific circumstances of Nationwide current accounts. He said the building society believed there were different contractual positions for customers in credit and those in the red. "It follows, as night follows day, that the debit customers regard their overdraft as the main part of the service," he added. This is the crux of the legal argument. A central part of the banks' defence is that the regulations on unfair terms in consumer contracts cannot be applied to the main or core part of a contract with a customer. Mr Vos also denied another line of attack put forward by the OFT. The regulator believes that as well as breaching the 1999 consumer contract regulations, overdraft charges are also unfair penalties under common law. "The penalty doctrine cannot apply as there is no breach in our contract," he said. At this point, Mr Brian Doctor QC, acting for the OFT, read out a clause from an explanatory leaflet published by Nationwide. This said precisely the opposite - that customers who went overdrawn were indeed in breach of their contracts. Mr Vos admitted this was a "googly" and one of the OFT's "best forensic points". But he dismissed the issue by saying that the leaflet Mr Doctor quoted was simply wrong. Further criticism of the OFT came from Mr Bankim Thanki QC, representing Lloyds TSB, the UK's largest current account provider. He said the OFT was "wrong" to say that the provision of unauthorised overdrafts did not constitute a service. "The service requires extra work with an infrastructure in place, including communicating with the customer," he added. Mr Thanki also denied that Lloyds TSB's terms and conditions could be construed as imposing an unfair penalty charge for any breach of contract. He said the terms and conditions contained "no suggestion of a levy on the customers for breaching obligations". The OFT is now expected to start outlining its case next Tuesday. It seems certain that the case will last for at least a further two weeks once the banks have been given the opportunity to reply. The case had originally been scheduled for eight days. Earlier this week, the judge commented on the scale of material under consideration, describing the volume of evidence submitted as an "enormous burden". The outcome of the long-awaited court case could bring a significant change to the UK current account market. If the OFT argument is upheld, it could mean banks and building societies having to return billions of pounds collected from customers over the past six years. However, the losing side is expected to appeal, possibly all the way to the House of Lords, meaning the issue may not be resolved until next year.